June 21 marks the summer solstice for 2011. The summer solstice is when the Earth’s axis is most inclined to the sun, providing the most amount of sunshine for any day of the year. Often known as Midsummer’s day, marking the exact middle of the summer, periods of daylight get shorter following the solstice. For the ancients, the summer solstice was an important event. Knowing when the shortest and longest days of the year were important to enable early agricultural civilisations to establish when to plant and harvest crops. Indeed, the ancient monument of Stonehenge, in Salisbury, Great Britain, is thought to have been erected to calculate such events, and is still a major tourist attraction during the solstice when people travel from all over the country to celebrate the event at the ancient site. Stonehenge is, therefore, one of the oldest forms of timekeeping on Earth, dating back to 3100BC. While nobody knows exactly how the monument was built, the giant stones were thought to have been transported from miles away—a mammoth task considering the wheel hadn’t even been invented back then. 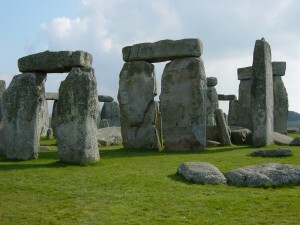 The building of Stonehenge shows that timekeeping was as important to the ancients as it is to us today. The need for acknowledging when the solstice occurred is perhaps the earliest example of synchronisation. Stonehenge probably used the setting and rising of the sun to tell the time. Sundials also used the sun to tell the time way before the invention of clocks, but we have come a long way from using such primitive methods in our timekeeping now. Mechanical clocks came first, and then electronic clocks which were many times more accurate; however, when atomic clocks were developed in the 1950’s, timekeeping became so accurate that even the Earth’s rotation couldn’t keep up and an entirely new timescale, UTC (Coordinated Universal Time) was developed that accounted for discrepancies in the Earth’s spin by having leap seconds added. Today, if you wish to synchronise to an atomic clock, you need to hook up to a NTP server which will receive an UTC time source from GPS or a radio signal and allow you to synchronise computer networks to maintain 100% accuracy and reliability. Most towns and cities would have a main clock, such as Big Ben in London, and for those living near-by, it was fairly easy to look out the window and adjust the office or factory clock to ensure synchronicity; however, for those not in view of these tower clocks, other systems were used. Commonly, somebody with a pocket watch would set the time by the tower clock in the morning and then go around businesses and for a small fee, let people know exactly what the time was, thus enabling them to adjust the office or factory clock to suit. When, however, the railways began, and timetables became important it was clear a more accurate method of time keeping was needed, and it was then that the first official time-scale was developed. As clocks were still mechanical, and therefore inaccurate and prone to drift, society again turned to that more accurate chronometer, the sun. It was decided that when the sun was directly above a certain location, that would signal noon on this new time-scale. 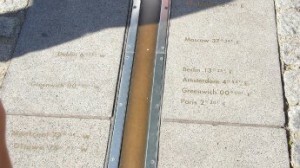 The location: Greenwich, in London, and the time-scale, originally called railway time, eventually became Greenwich Meantime (GMT), a time-scale that was used until the 1970’s. Now of course, with atomic clocks, time is based on an international time-scale UTC (Coordinated Universal Time) although its origins are still based on GMT and often UTC is still referred to as GMT. Now with the advent of international trade and global computer networks, UTC is used as the basis of nearly all international time. Computer networks deploy NTP servers to ensure that the time on their networks are accurate, often to a thousandth of a second to UTC, which means all around the world computers are ticking with the same accurate time – whether it is in London, Paris, or New York, UTC is used to ensure that computers everywhere can accurately communicate with each other, preventing the errors that poor time synchronisation can cause. When you set your watch to perhaps the speaking clock or the time on the internet, have you ever wondered who it is that sets those clocks and checks that they are accurate? There is no single master clock used for the world’s timing but there are a constellation of clocks that are used as a basis for a universal timing system known as UTC (Coordinated Universal Time). UTC enables all the world’s computer networks and other technology to talk to each other in perfect synchronicity which is vital in the modern world of internet trading and global communication. But as mentioned controlling UTC is not down to one master clock, instead, a serious of highly precise atomic clocks based in different countries all work together to produce a timing source that is based on the time told by them all. These UTC timekeepers include such notable organisations as the USA’s National Institute of Standards and Time (NIST) and the UK’s National Physical Laboratory (NPL) amongst others. These organisations don’t just help ensure UTC is as accurate as possible but they also provide a source of UTC time available to the world’s computer networks and technologies. To receive the time from these organisations, a NTP time server (Network Time Server) is required. These devices receive the broadcasts from places like NIST and NPL via long wave radio transmissions. The NTP server then distributes the timing signal across a network, adjusting individual system clocks to ensure that they are as accurate to UTC as possible. A single dedicated NTP server can synchronize a computer network of hundreds and even thousands of machines and the accuracy of a network relying in UTC time from the broadcasts by NIST and NPL will also be highly precise. The NIST timing signal is known as WWVB and is broadcast from Boulder Colorado in the heart of the USA whilst the UK’s NPL signal is broadcast in Cumbria in the North of England and is known as MSF – other countries have similar systems including the DSF signal broadcast out of Frankfurt, Germany. Atomic clocks are without doubt the most accurate time pieces on the face of the planet. In fact the accuracy of an atomic clock in incomparable to any other chronometer, watch or clock. While an atomic clock will not lose even a second in time in thousands upon thousands of years, you’re average digital watch will perhaps lose a second in just a few days which after a few weeks or months will mean your watch is running slow or fast by several minutes. The same can also be said for the system clock that controls your computer the only difference is that computers rely even more heavily on time than we ourselves do. Nearly everything a computer does is reliant on timestamps, from saving work to performing applications, debugging and even emails are all reliant on timestamps which can be a problem if the clock on your computer is running too fast or slow as errors can quite often occur, especially if you are communicating with another computer or device. Fortunately, most PCs are easily synchronized to an atomic clock meaning they can be accurate as these powerful time keeping devices so any tasks performed by your PC can be in perfect synchronicity with whatever device you are communicating with. In most PC operating systems an inbuilt protocol (NTP) allows the PC to communicate with a time server that is connected to an atomic clock. In most versions of Windows this is accessed through the date and time control setting (double clicking the clock in the bottom right). However, for business machines or networks that require secure and accurate time synchronization, online time servers are just not secure or accurate enough to ensure your network is not vulnerable to security flaws. However, NTP time servers that receive the time direct from atomic clocks are available that can synchronize entire networks. These devices receive a broadcasted timestamp distributed by either national physics laboratories or via the GPS satellite network. NTP servers enable entire networks to all have exactly synchronized time which is as accurate and secure as is humanly possible. Precision is becoming increasingly important in modern technologies and none more so than accuracy in time keeping. From the internet to satellite navigation, precise and accurate synchronicity is vital in the modern age. In fact many of the technologies that we take for granted in today’s world, would not be possible if it wasn’t for the most accurate machines invented – the atomic clock. Atomic clocks are just timekeeping devices like other clocks or watches. But what stands them apart is the accuracy they can achieve. As a crude example your standard mechanical clock, such as a town centre clock tower, will drift by as much as a second a day. Electronic clocks such as digital watches or clock radios are more accurate. These types of clock drift a second in about a week. However, when you compare the precision of an atomic clock in which a second will not be lost or gained in 100,000 years or more the accuracy of these devices is incomparable. Atomic clocks can achieve this accuracy by the oscillators they use. Nearly all types of clock have an oscillator. In general, an oscillator is just a circuit that regularly ticks. Mechanical clocks use pendulums and springs to provide a regular oscillation while electronic clocks have a crystal (usually quartz) that when an electric current is run through, provides an accurate rhythm. Atomic clocks use the oscillation of atoms during different energy states. Often caesium 133 (and sometimes rubidium) is used as its hyperfine transitional oscillation is over 9 billion times a second (9,192,631,770) and this never changes. In fact, the International System of Units (SI) now officially regards a second in time as 9,192,631,770 cycles of radiation from the caesium atom. Atomic clocks provide the basis for the world’s global timescale – UTC (Coordinated Universal Time). And computer networks all over the world stay in sync by using time signals broadcast by atomic clocks and picked up on NTP time servers (Network Time Server). Synchronization of computer networks is something that many administrators take for granted. Dedicated network time servers can receive a time source and distribute it amongst a network, accurately, securely and precisely. However, accurate time synchronization is only made possible thanks the time protocol NTP – Network Time Protocol. NTP was developed when the internet was still in its infancy and Professor David Mills and his team from Delaware University were trying to synchronise the time on a network of a few machines. They developed the very earliest rendition of NTP which has continued to be developed to this very day, nearly thirty years after its first inception. NTP was not then, and is not now, the only time synchronisation software, there are other applications and protocol that do a similar task but NTP is the most widely used (by far with over 98% of time synchronisation applications using it). It is also packaged with most modern operating systems with a version of NTP (usually SNTP – a simplified version) installed on the latest Windows 7 operating system. NTP has played an important part in creating the internet we know and love today. Many online applications and tasks would not be possible without accurate time synchronization and NTP. Online trading, internet auctions, banking and debugging of networks all rely on accurate time synchronisation. Even sending an email requires time synchronisation with email server – otherwise computers would not be able to handle emails coming from unsynchronised machines as they may arrive before they were sent. NTP is a free software protocol and is available online from NTP.org However, most computer networks that require secure and accurate time mostly use dedicated NTP servers that operate external to the network and firewall obtaining the time from atomic clock signals ensuring millisecond accuracy with the world’s global timescale UTC (Coordinated Universal Time). We all rely on the time to keep our days scheduled. Wristwatches, wall clocks and even the DVD player all tell us the time but on occasion, this is not accurate enough, especially when time needs to be synchronized. There are many technologies that require extremely accurate precision between systems, from satellite navigation to many internet applications, accurate time is becoming increasingly important. However, achieving precision is not always straight forward, especially in modern computer networks. While all computer systems have inbuilt clocks, these are not accurate time pieces but standard crystal oscillators, the same technology used in other electronic clocks. The problem with relying on system clocks like this is that they are prone to drift and on a network consisting of hundreds or thousands of machines, if the clocks are drifting at a different rate – chaos can soon ensue. Emails are received before they are sent and time critical applications fail. Atomic clocks are the most accurate time pieces around but these are large scale laboratory tools and are impractical (and highly expensive) to be used by computer networks. However, physics laboratories like the North American NIST (National Institute of Standards and Time) do have atomic clocks which they broadcast time signals from. 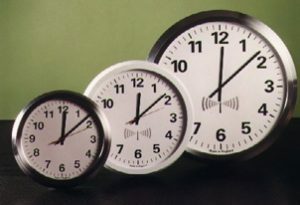 These time signals can be used by computer networks for the purpose of synchronization. In North America, the NIST broadcasted time code is called WWVB and is transmitted out of Boulder, Colorado on long wave at 60Hz. The time code contains the year, day, hour, minute, second, and as it is a source of UTC, any leap seconds that are added to ensure parity with the rotation of the Earth. Receiving the WWVB signal and using it to synchronize a computer network is simple to do. Radio reference network time servers can receive this broadcast throughout North America and by using the protocol NTP (Network Time Protocol). A dedicated NTP time server that can receive the WWVB signal can synchronize hundreds and even thousands of different devices to the WWVB signal ensuring each one is to within a few milliseconds of UTC.